We read non-fiction for one of two reasons. We read it to learn, like our reading of a biography to learn more about a person we admire. And then, sometimes, we read to think. 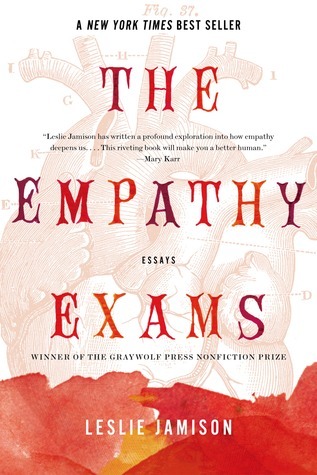 In this collection of essays, Leslie Jamison challenges everything we think about empathy. Pieces about gang violence, terrible diseases, and time in prison ask why we empathize with people, what we want from others when bad things happen, and how to walk the line of acknowledging pain without glorifying it. In each essay, the research is apparent as we are moved by the plight of prisoners and grieve for sick people who feel like no one could possibly understand what they are going through. Intertwined with each piece are the author's musings about her personal pain. Jamison is unafraid to ask tough questions of herself and her readers, even when her answers embarrass her. I found myself nodding in recognition as she asserts that empathy does not come naturally and that there is nothing wrong with admitting the personal work it takes to feel grief for other people's problems. The Empathy Exams is both intensely personal and incredibly universal. The one essay that fell a bit flat for me was "The Immortal Horizon," where Jamison chronicles a race that is basically impossible to complete. In this essay, the people suffering have decided to inflict the pain on themselves as they attempt to run a course that is basically unmarked wilderness. But in this essay and others, Jamison asks if someone's pain is less important just because we deem it so. If we all make bad choices at one point or another, how can we show compassion instead of condemnation? It's presumptuous to say that a book can change your life. Books can certainly accomplish that, but the books that resonate with me may not be world-shaking for you. The Empathy Exams may be one of the few exceptions to that rule. Because Jamison is so brutally honest in questioning herself, you have no choice but to ask the same questions as you read. This incredible collection of essays is a challenge to each of us to be more open, more aware, and to show more kindness. That can only be a good thing. "Sure, some news is bigger than other news...But I don't believe in a finite economy of empathy; I happen to think that paying attention yields as much as it taxes. You learn to start seeing." This sounds like a very insightful book of essays. Thanks for bringing it to my attention. It was a great read. I hope you get the chance to pick it up! Doesn't seem like something I would pick up normally, but maybe I will now. I would love to hear your thoughts if you do read it! Thanks for pointing this book out to us. I've never heard of it but am interested. I have an issue with chronic depression/anxiety and once mentioned to a doctor that one of my problems is having "too much" empathy. I would be curious to see if this is addressed in this collection. So thanks again! There is not a specific essay about it, but I think she does address the issue of seeming too emotional in several places. This sounds simply amazing. Thanks for reviewing it, otherwise I would never have heard of it. I'm trying to remember where I read about it. I think it was one of those "fall books you have to read!" lists.